Afghanistan food recipes which are user friendly are not easy to find. Here, I am inputting mostly those Afghanistan food recipes which I know work and have tried out on my own family and friends. For Afghan culture's sake, I do have to include a few Afghan dishes which I don't actually care for. If you are here, you may already know that the main food Afghanistan facts are that the staple Afghan foods are naan and rice. So we have to include the main Afghan food recipes for the foods you'll definitely be eating at an Afghan wedding! Here's the best recipe I've found for making Afghan naan (bread) outside of Afghanistan. It is slightly altered from Mic's original contribution to All Recipes, but he is a genius! Punch down dough. Pinch off small handfuls of dough, about the size of your fist. Form into balls, and place on tray. Cover with a towel, and allow to double, about 30 minutes. While the dough rises the second time, pre-heat your grill to high heat. At grill side, form one ball of dough into a thin oval. Lightly oil grill with melted butter. Place dough on grill, and cook for 2-3 minutes, or until puffy and lightly brown. Brush the top side with butter, then flip the naan. Brush cooked side with butter, and cook until the second side is also lightly brown. Remove from grill, and continue cooking all dough balls until finished. Cover the cooked naan with a towel to keep it moist and warm. Try not to eat too much! 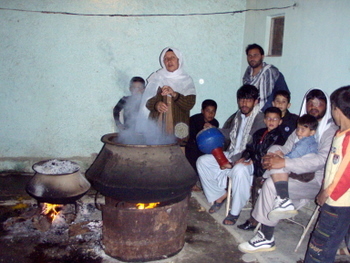 The two main Afghanistan fast foods are boulanee and boulanee katchalu. One is made with leeks, the other with potato. Chips (french fries) are also awesome fresh from the cooking pot in the bazaar. They are sprinkled with a special french fry spice. Meaning: The secret of the kebab is garlic." Minced garlic - lots of it, like 10 cloves or more! Marinate the meat at least 2 hours, slide onto the skewers, and grill to your preference. Serve in fresh hot naan, with plenty of chili pepper spice! Wash down with coke-a-cola, tea, or water. Well, a page on Afghanistan food recipes would not be complete without Chapli Kebab. Mix all ingredients in a bowl. Shape meat patties into 1/4 inch thick oblongs, or a round shaped patty. Fry in oil on both sides until cooked through. Serve with tomato and onion salad and fresh naan. Garnish with fresh cilantro and lemon wedges. Need more Afghanistan Food Recipes? I admit, this is just a sampling. Let me know what else you'd like to try, and I'll upload it here!